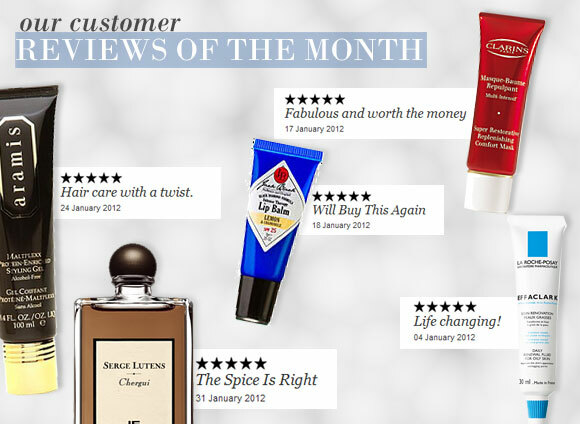 Below are our favourite reviews for January. Review are picked for being helpful, insightful or just really interesting. “Perfumer Christopher Sheldrake created Chergui for Serge Lutens in 2001. On a blotter the first thing that hits you is a great big wollop of spice, a bit like the smell of orange peel as it hits the bottom of a pan of molten caramelized sugar laced with cumin; bitter/sweet and just a little bit burnt. As the fragrance softens it becomes a tad “greener” with notes of angelica, hay and greengage jam. Finally base notes of tobacco, leather and black pepper come through for a subtly masculine suave and stubbly finish. “I was cynical as to how it was possible to have fragrance and good hair care. Aramis Maltplexx Protein- Enriched Hair Styling Gel has changed my mind. The same fabulous spicy fragrance of Aramis combines with a great hair styling control gel. “I’ve been looking for a good lip balm for quite a long time and now I’ve found it. After using the balm for a week my winter chapped lips are in much better condition and I’m not experiencing the daily dryness that leads to chapping in the first place, so I think Intense Therapy is a good name. I like the squeeze tube application and the fragrance is very pleasant as it’s light and not at all overpowering. “My skin is drier and tighter in the winter due to heating indoors and cold air outdoors (I spend an hour walking my dog each day and live in Northern Scotland). This mask is a wonderful nourishing skin saver, and I find I can use it not only as instructed but even just leave on all night for a boost that lasts a good few days, particularly that area along the top of cheekbones where I feel the effects of winter the most. “I’ve struggled with moderate acne for all of my teenage years, with there never being a day that I have clear skin. Plus, my cheeks are covered in scars from previous spots that i’ve picked at (not good, I know!). I used Effaclar Duo for about a month, and though my skin did improve slightly from use, I still wasn’t happy, so decided to buy Effaclar K as well. Its now been about a month and a half since I started using Effaclar K, and I literally can’t praise it enough, i recommend it to anyone i know who is having skin problems, it’s brilliant!! My skin is finally smooth, with scars gradually fading. Though i do still get some spots, they are never any trouble, and Effaclar K stops them from developing too much. It’s also a great base for makeup, and I find that it doesn’t make my skin at all dry or flaky as previous acne treatments have. Perfumer Christopher Sheldrake created Chergui for Serge Lutens in 2001. On a blotter the first thing that hits you is a great big wollop of spice, a bit like the smell of orange peel as it hits the bottom of a pan of molten caramelized sugar laced with cumin; bitter/sweet and just a little bit burnt. As the fragrance softens it becomes a tad "greener" with notes of angelica, hay and greengage jam. Finally base notes of tobacco, leather and black pepper come through for a subtly masculine suave and stubbly finish. Up close it works its magic well on a romantic summer evening. Pure class. This entry was posted on Sunday, January 1st, 2012 at 3:58 pm and is filed under Reviews of the Month, Tried & Tested. You can follow any responses to this entry through the RSS 2.0 feed. You can skip to the end and leave a response. Pinging is currently not allowed.